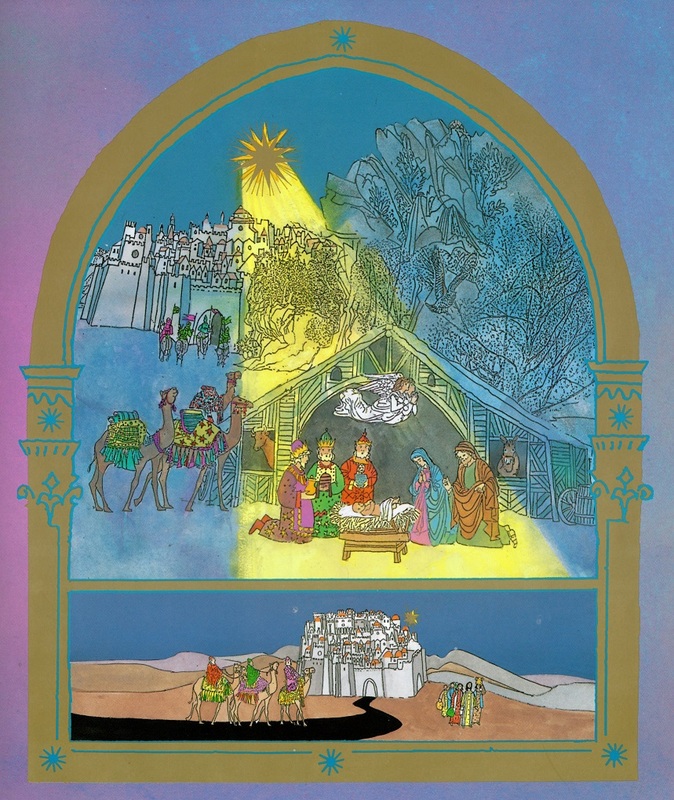 Brian Wildsmith pretty much owns the Nativity picture book market. Obviously there are thousands of retellings of it out there, but for me Wildsmith is the absolute Don. 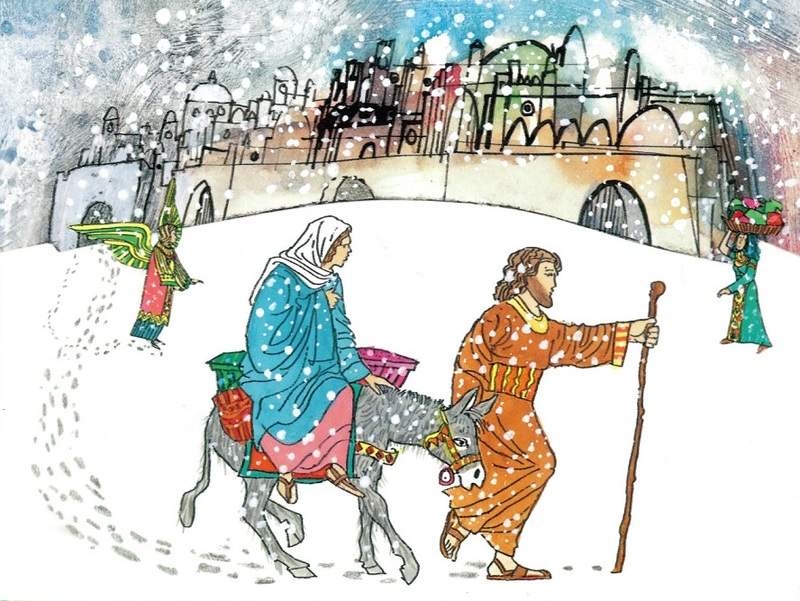 We’ve heard the story from the point of view of Jesus, Joseph and the donkey. Hell, even the cat and dog have had their say. In Mary Wildsmith puts the Queen of Heaven, the eternal mother of us all centre stage. He tells Her life story framed as gold painted wooden altarpieces. Although it sticks mainly to text from the gospels, Mary isn’t an overly pious book. 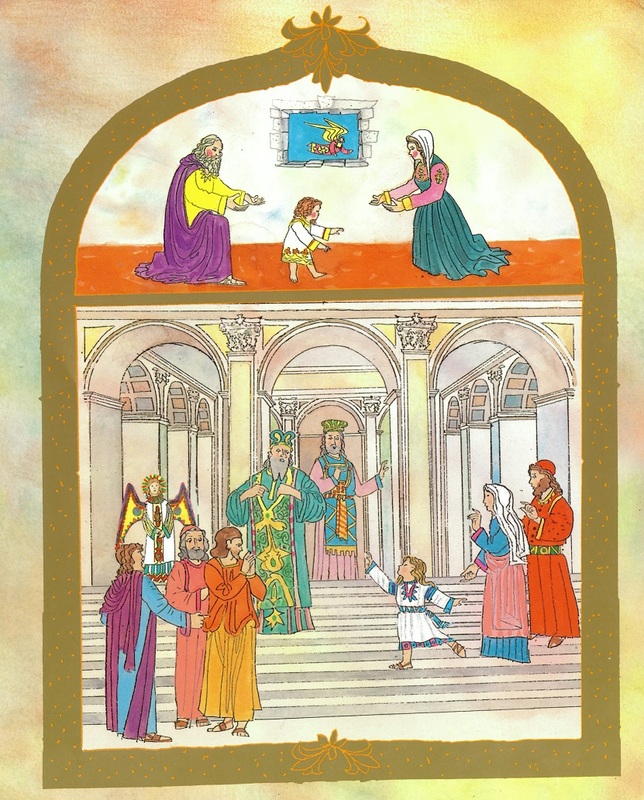 The first we see of her aged three, she is dancing on the steps of the temple. I love the shocked expressions of the priests, and even the ever present angel is taken aback. 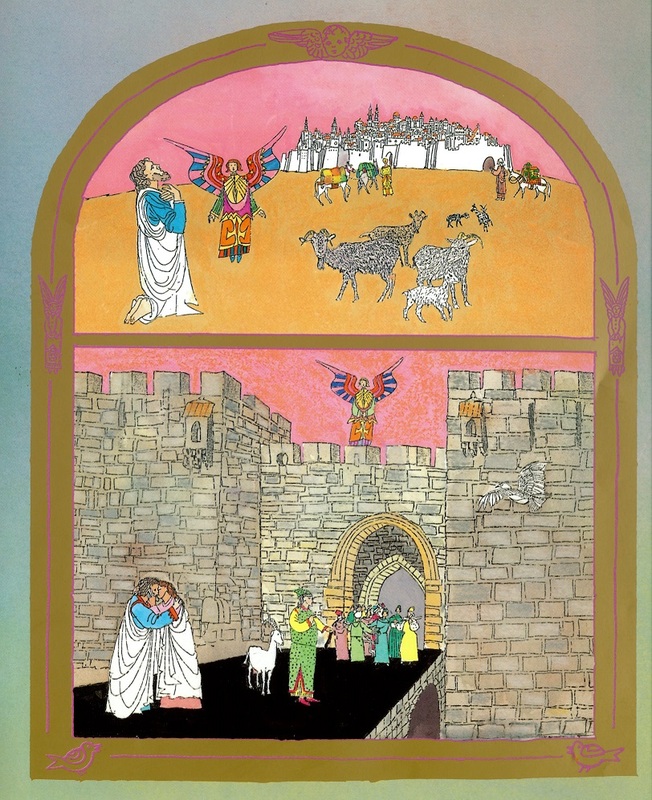 The artistry on display here is dazzling, drawn lightly in ink and painted with truly luminous colours, it’s far more likely to make me believe than any stained glass window. 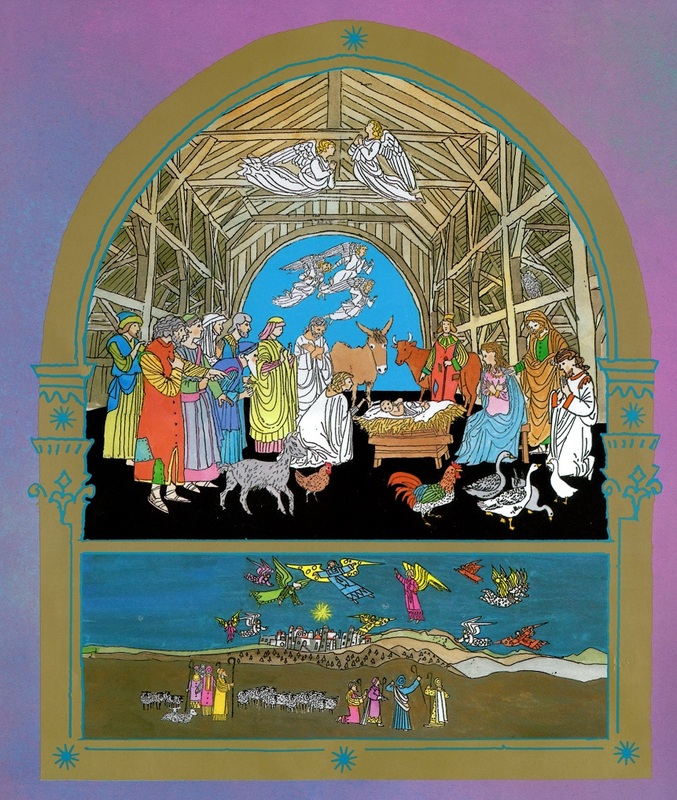 The central images of the birth and the gathering of angels, shepherds and kings cleverly use the split windows to great effect. I particularly love the tiny sheep gathered to hear the news. 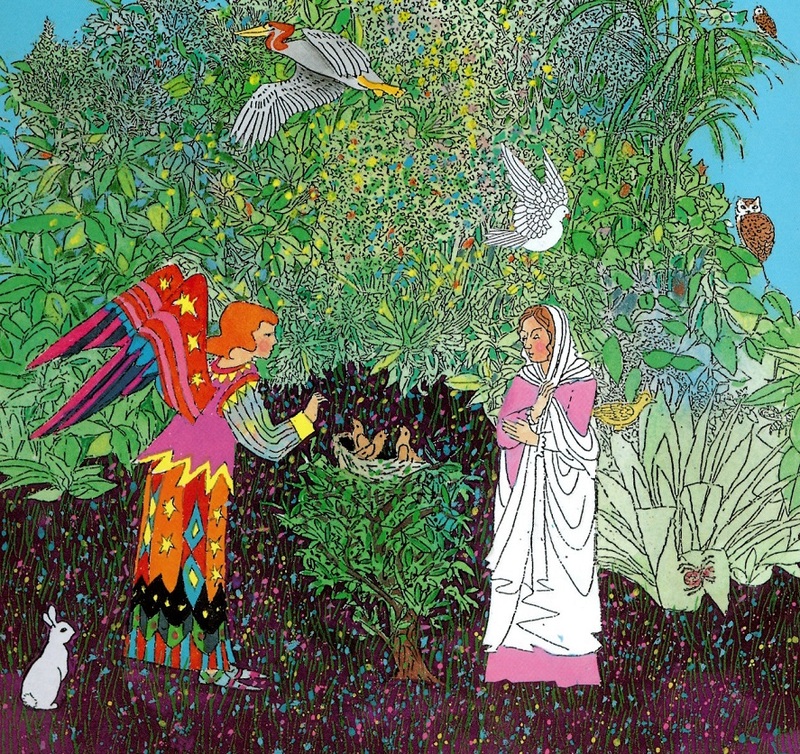 Wildsmith keeps up the Christmassy feel all though the book, with a psychedelic splurge of green, red, yellow, pink, purple and blue cropping up all over the place. It’s there as Jesus carries his cross through the streets, where even the Roman soldiers wear the colours. And when Christ finally ascends to heaven there is an almighty explosion as the Holy Spirit enters into Mary and the disciples. It’s the biggest trip ever. Happy Christmas Mary, we love you Mother Christmas. Tags: Brian Wildsmith, Mary. Bookmark the permalink.